Shares of Amcor didn’t have the best of years in 2018, but have recovered slowly and surely from the lows of last October. This is also as the company’s acquisition of US peer Bemis has created an additional layer of complexity. The transaction, thanks to the government shutdown has also been delayed, and has been pushed into the second quarter. Investors seem to have taken the revelation in their stride and reflects (much like the broader market) the excessive sell-off in Amcor’s shares last year, the value present and the synergies to come from the transformational deal. While caution over the trade war (which we see as being resolved) continues to ebb and flow, markets have generally pushed higher this year, on the view that the situation (and global economy) is not as bad as it seems, and nowhere near the excessive pessimism that was priced in during December quarter. This is also very relevant to Amcor, which is soon to become the world’s largest packaging company. While having a defensive tilt, packaging firms typically do better when economic activity is strong. A further factor is that advent of retail disruption (think Amazon and co) means that the need for demand for high quality packaging has received another tailwind. The US government shutdown (in essence a stoush over funding for Donald Trump’s wall) has commanded newspaper column inches, and while a reprieve has been granted, is estimated to have cost the US economy around $4 billion. It has also seen employees in Washington come back to a backlog of paper work – some have estimated that the Inland Revenue Service will take a year to catch up. The stalemate in Washington has also had an impact on Amcor. The company last week announced that it has caused delays in US anti-trust clearance and the SEC review of documents in relation to the packaging company’s acquisition of Bemis. The transaction close now looks to be pushed out a quarter to the end of June. 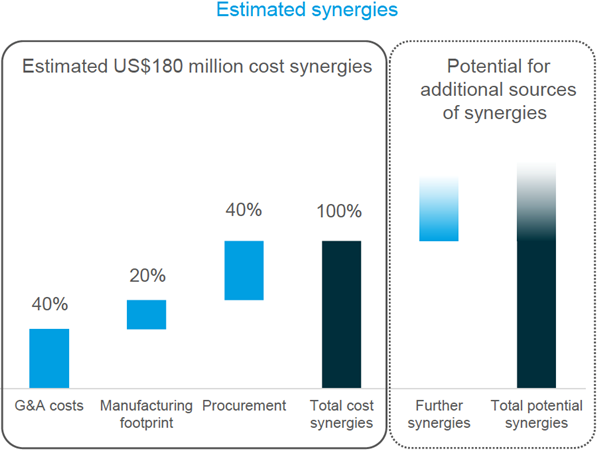 Still it is proceeding and continues to look to be a good one for Amcor with US$180 million in synergies from the $9 billion deal. The all-stock acquisition will make Amcor the largest consumer packaging company in the world and should proceed smoothly post approval, with management having a great record of integrating targets. The proposed merger with Bemis will create the world’s biggest manufacturer of flexible plastic packaging products. While this deal is not without its risks, we believe it has significant strategic merit, and will make the combined entity a very strong player in an industry with attractive characteristics. Amcor CEO Ron Delia has highlighted the attributes of the Bemis deal, saying the combination of the two companies will create the global leader in consumer packaging with sales of US$13 billion, EBITDA of around US$2.2 billion and annual cash flow after capital expenditure (but before dividends) in excess of US$1 billion. Strategic merits include a global footprint, greater scale, increased exposure to attractive markets and products, along with best-in-class operating capabilities. The merger is forecast to deliver pre-tax cost synergies between the two companies of US$180 million per annum by the end of year three, after the deal is concluded, and be accretive to earnings per share by a double-digit percentage, assuming the full cost synergies are achieved. Potential revenue synergies offer further upside. The transaction is an all stock deal at a fixed ratio of 5.1 Amcor shares for each Bemis share, resulting in Amcor and Bemis shareholders owning approximately 71% and 29% of the combined entity, respectively. Bemis’ share price has also rebounded and is currently trading back above the closing price prior to the deal announcement, and not too far below the implied offer value. This also suggests that the market’s doubts over the deal being completed has subsided, even though it has been delayed. Amcor is trading on approximately 15.4 times forecast FY19 earnings, falling to 14.2 times the following year. We view the current valuation as attractive, with a projected dividend yield over the same time frame of 5.0% expanding to 5.4%.